This statistic shows the results of a survey carried out in 2016 to find out about public opinion on corruption in Latin America and the Caribbean. 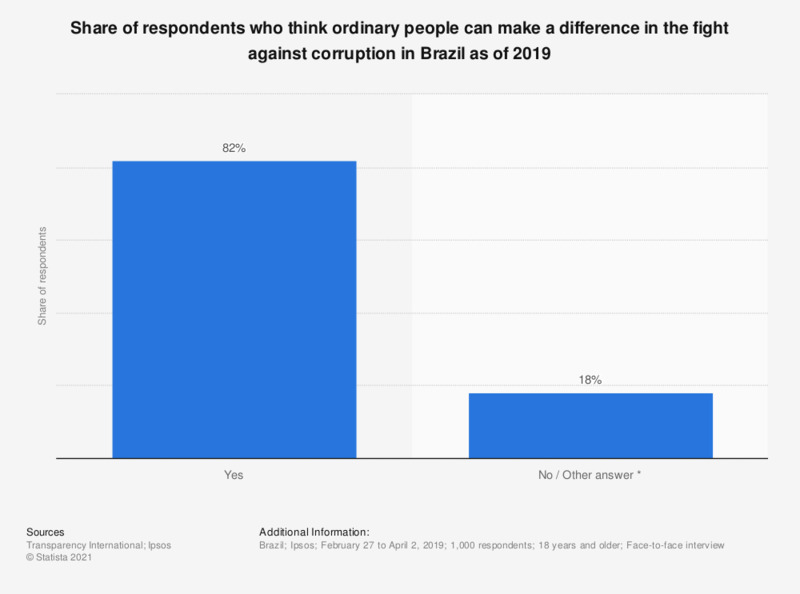 When asked whether they thought ordinary people had influence in the fight against corruption, 83 percent of respondents in Brazil stated that common people could make a difference. For the sake of simplicity, the wording chosen for this statistic may differ slightly from the one in the survey. Respondents were asked as follows: "Please tell me whether you agree or disagree with the following statement: 'Ordinary people can make a difference in the fight against corruption'". Possible answers were: "Agree", "Strongly disagree", "Disagree", "Neither" and "Don’t know". Only "Agree" responses were considered as "Yes". The source adds the following methodology information: "Face-to-face household interviews were conducted either with Computer Assisted Personal Interviewing (CAPI) or Paper-and-Pencil Interviewing (PAPI)". Do you think corruption in Brazil has increased over the past year? In your dealings with the public sector, how important are personal contacts and/or relationships to get things done? Have you or anyone living in your household paid a bribe in any form in the past 12 months?